This quilt was made as a surprise for a friend expecting her first child, a daughter. This friend is a dedicated Disney aficionado, and I knew right away I wanted to do something related to Disney. But focusing on one princess seemed…inaccurate. This friend loved all things Disney, so I decided to go for several at once. I sent her a message asking who were her favorite Disney princesses, and she replied back with several. To her credit, she had to have known I was up to something but didn’t ask any more questions despite my strange messages to her. 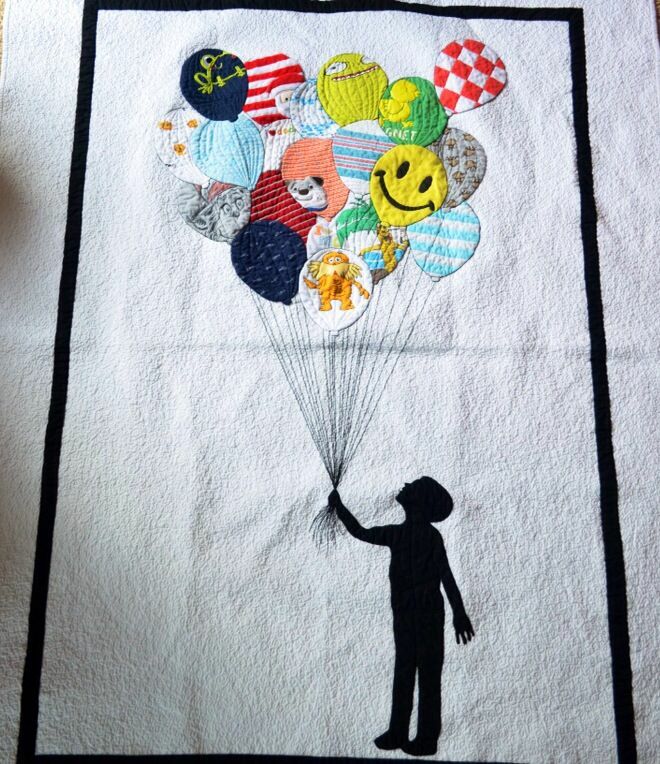 I’d seen on Pinterest a quilt with a little boy silhouette holding balloons, and I remembered the balloons being a big part of that Disney World experience. I decided to go that route. I purchased several pink fat quarters and made the balloon shapes. That step was easy enough. The girl and princess silhouettes took some more thought. I looked around at a LOT of little girl silhouettes before settling in on this one. In the end, I picked this one because you could see the cute, wispy pig tails, and it made me think of some spunky girls I’ve known, but you could also tell she was wearing a pretty fluffy and fancy dress. I liked the balance in there and felt that any daughter my friend had would have a similar dynamic. The princess profiles were easy to find, but they didn’t want to translate to fabric all that well. To be honest, there were a couple of points where I thought the girl was just going to have to hold regular balloons sans princess. It was the lips and chin that didn’t want to work with the fabric and sewing machine, and in the end I took another friend’s advice and simply smoothed out the lips and chin, letting the hair, brow, and nose do most of the defining. For the most part it worked. If you look closely, you can see another princess added in for Daddy – Disney’s newest acquired princess – Leia Organa. Funny enough, one part I was having to focus pretty hard on was the strings. I couldn’t, of course, have real strings hanging loose. That wouldn’t be very durable, and this quilt was for a baby, making them a safety hazard. So I decided to use an extra wide stitch and keep it simple. I wanted to make sure the strings looked natural and relaxed like they can with actual balloons. I was relieved when they turned out well. This quilt was a first for me in another technique as well. I used a pink bobbin and black top thread while quilting the silhouette. The backing was such a pretty pink that anything distracting from it would have been a shame, but the black silhouette also needed to stay clean, so I held my breath and gave it a go. I was so thrilled when I realized I didn’t have to chose between ruining my top or backing! After all that I quilted it together with a small stipple pattern. I’m happy to report that the quilt gets regular use! I put the silhouettes of mommy’s favorite princesses on there and included Princess Leia for daddy.